One of the sobering truths about fly fishing is that you don’t need that many flies to catch fish. A lifetime of experience has taught me that half a dozen is enough for trouting and two or three suffice for salmon, but it doesn’t stop me tying more. After all, there is always that very slight chance that you might come across a fish which needs something subtly different – like the Elsie, which George Kelson tied with extra large Grande Breve Tocate cheeks and described as just the thing for fish “lying behind upright rocks and large boulders”. The problem with salmon, in my experience, is that sometimes you can catch them and sometimes you can’t. It is when you can’t that you wish you had lots more flies and I guarantee you that if you buy this book and tie everything in it, your problems in this regard are over. Mann and Gillespie have gathered together over 300 shrimp and Spey patterns and Merlin Unwin Books have illustrated them in knock-your-eye-out style in a book that it really was a pleasure to review. Not only do you get a cornucopia of flies, you get a potted history of almost all of them, together with tying and fishing tips. Since the flies have been gathered together from all around the world, this is a volume with international appeal and since it is the first British book on patterns which has caught my eye in half a decade, I can recommend it. Also see, Featherwing and Hackle Flies for Salmon and The Complete Illustrated Dictionary of Salmon Flies by the same author. 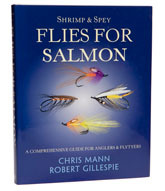 Shrimp and Spey Flies is now out of print.